During the early evolution of the temperature filament a pressure gradient forms in response to input heating from an electron beam. At these early times, the transport of thermal energy is observed to be in agreement with classical theory. This Chapter is concerned with the behavior of the system once this classical regime is ended. The transition into an enhanced, or anomalous, transport regime, and away from the classical regime, was shown in Fig. 1.3 (Ch. 1 web). That spectrogram clearly indicates a stark difference in the power spectra of each regime. Investigation into the character of the enhanced transport spectra finds that these spectra feature an exponential dependence in frequency. Review of the measured signals finds that the exponential spectra are only observed during times when solitary pulses are present. The pulses are of Lorentzian shape, which allows for an analytic relationship between them and the exponential spectra. Reports of exponential power spectra from other laboratory plasma devices suggests that the existence of exponential power spectra due to Lorentzian pulses in time series measurements is a universal feature of plasma turbulence, with direct relation to anomalous transport. A single trace of electron temperature is presented in Fig. 4.1. Panel (a) is the complete time series acquired at (r,z) = (0.8, 384) cm while panel (b) focuses on the time region in which fluctuation activity is observed. This is the same data set as the measurement shown in Fig. 2.13. The radial position is in the outer region (as defined in Fig. 2.16). The semi-transparent, colored rectangles are used to indicate the windows used for the calculation of FFT power spectra to be shown in the following figure. Time labels within the rectangles indicate the central time of the FFT window. Figure 4.1: Electron temperature time series at (r,z) = (0.8, 384) cm. Semi-transparent rectangles indicate the time windows used to calculate FFT power spectra shown in Fig. 4.2. The time labels represent the center time of the FFT window. (a) Little heating reaches this outer radial position, though activity is noticeable after t=6 ms. (b) Zoomed in view of the activity from (a). Figure 4.1a illustrates that little thermal energy reaches this outer radial position. The temperature is nearly the same as for the unheated afterglow plasma. A brief temperature increase is noted at t = 0.55 ms, though the only noticeable effects occur after 6 ms. Panel (b) provides a perspective for these later time fluctuations. The first set of fluctuations corresponds to the coherent drift-Alfvén mode. 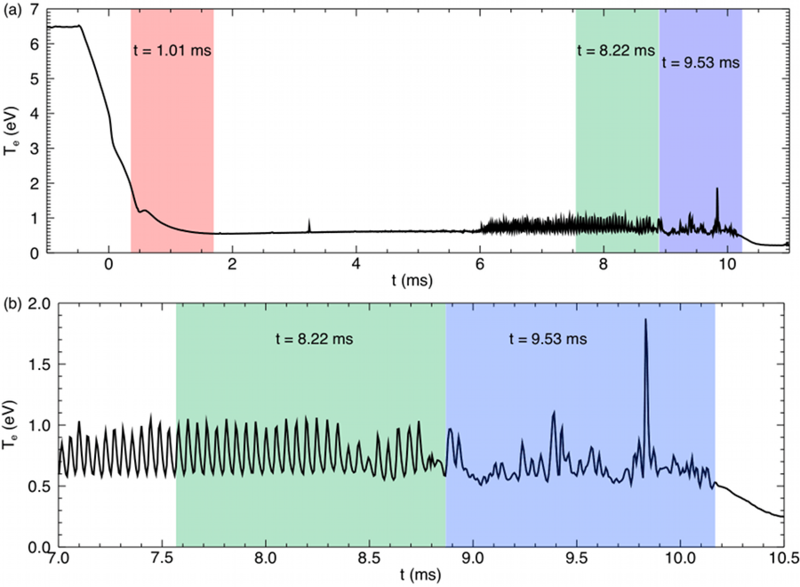 These oscillations are dominant until approximately t = 8.8 ms, at which time the fluctuations become turbulent and no coherent mode is observed. Even with a lack of coherent modes, there are solitary structures, or pulses, evident in the time series. One large amplitude event occurs at t = 9.82 ms in Fig. 4.1b. Figure 4.2 plots the FFT power spectra corresponding to each of the three regions highlighted in Fig. 4.1. The spectra from the earliest time window (solid red), centered on t = 1.01 ms, displays no coherent modes. Above f = 10 kHz this spectra is below the noise level of the system. This is an expected result since the measurement shown in the previous figure suggests there are no fluctuations during this time. The spectra centered on t = 8.22 ms (dotted green) shows many peaks corresponding to coherent modes. These are the drift-Alfvén mode and its harmonics. The spectra centered on t = 9.53 ms is completely different from the other two. 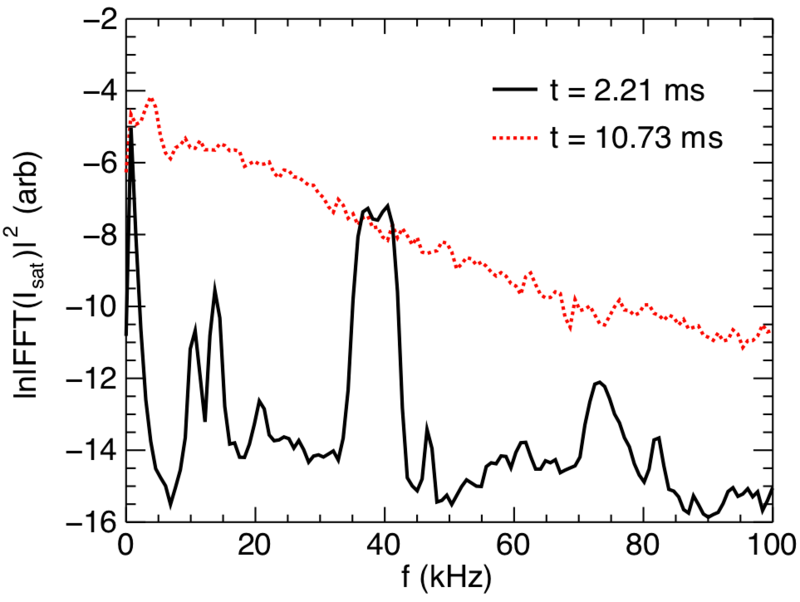 In the semi-log presentation of the plot, the behavior of the 9.53 ms spectra appears linear across 20 – 100 kHz. An exponential dependence on frequency produces straight-line plots in the semi-log format. The difference between the latest time spectra, t = 9.53 ms, and those from the two earlier times is that it is the only one to feature an exponential character. Figure 4.2: Electron temperature power spectra corresponding to the indicated regions of Fig. 4.1. While the regions are labeled on the measured trace, the FFT analysis is only performed on the fluctuating component of the time series. Observations of exponential spectra and pulse structures are made throughout the experimental range of this system. In all cases the exponential spectra appear only during the anomalous transport phase of the experiment. This Chapter details the observations of such spectra and their related pulses. A model relating the characteristics of the pulses to the spectra is presented. Exponential spectra are measured for positions within the temperature filament experiment where individual time traces display Lorentzian pulses. Figure 4.3 presents a diagram outlining where Lorentzian pulses of positive polarity are observed within the radial profile of the filament. A typical electron temperature profile (solid black) is shown to provide perspective for the three regions of unique behavior: center, gradient, and outer. The center region corresponds to the radius of the LaB6 heating source (drawn as the purple circle in the lower-left of the figure). This region is where the thermal wave of Chapter 3 is observed. 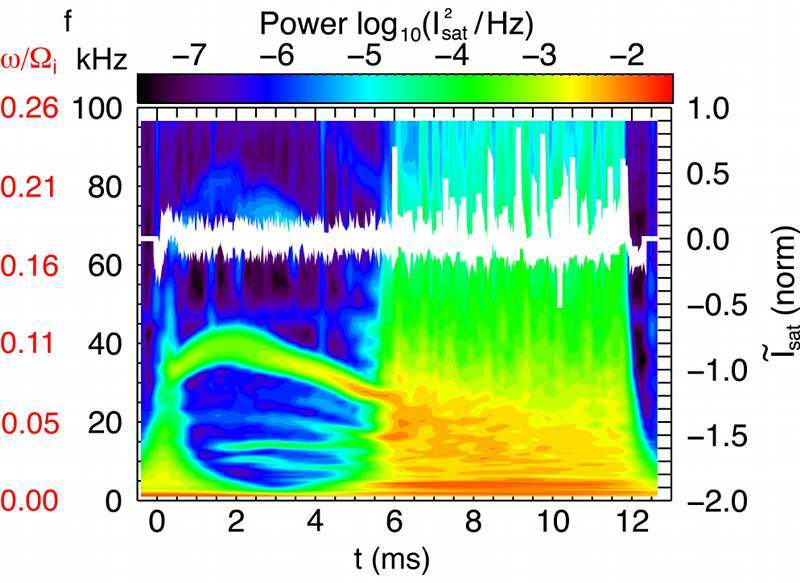 Lorentzian pulses of negative polarity, similar to the one shown in Fig. 4.11 are found exclusively within this region. Figure 4.3: A diagram of the regions of interest within the radial temperature profile of the filament. The LaB6 crystal is shown to provide perspective. The fluctuations in the filament can be classified according to three regions: Center, Gradient, and Outer. 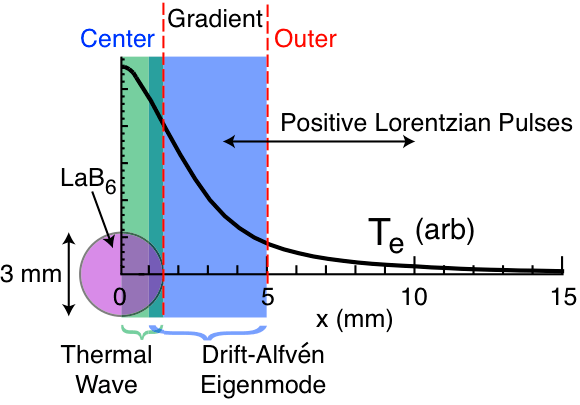 The thermal wave is confined to the center while the drift-Alfvén eigenmode peaks in amplitude within the gradient region. There is some overlap between these waves. Lorentzian pulses of positive polarity are primarily observed in the outer region, though some are identified within the gradient region. 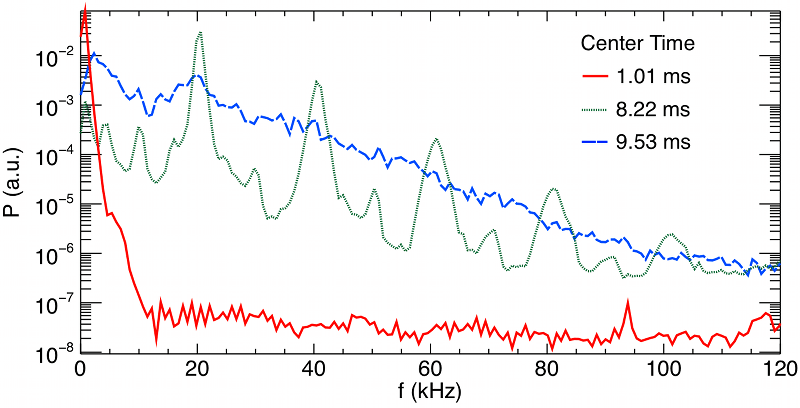 Negative polarity Lorentzian pulses are observed in the center region. The gradient region is where the amplitude of the temperature gradient is largest. This results in the largest amplitude for the drift-Alfvén eigenmode. As an eigenmode, the drift-Alfvén wave extends throughout the entire radial dimension, however, the diagram of Fig. 4.3 emphasizes the location of this maximum amplitude because that is where the wave is most readily observed. The outer region of the filament is where the more dramatic examples of Lorentzian pulses (positive polarity) are observed. As illustrated by Fig. 4.10, the low amplitude of the filament and background plasma fluctuations allows for the easy detection of pulses with large relative amplitudes. Such pulses are measured at radial positions of r > 0.75 cm. Exponential spectra are observed at times after the filament has transitioned from a classical transport phase into an anomalous transport phase. This behavior is clearly illustrated by Fig. 4.4 in which the time evolution of the power spectra (color contour) displays a sharp transition to broadband spectra at the same time, t ≈ 5.5 ms, as the Isat signal (solid white, upper half of the contour) begins to display large amplitude pulses. The spectra are computed using the Continuous Wavelet Transform (CWT) method in order to achieve a balance between temporal and frequency resolution. A comparison between CWT and FFT methods is presented in Appendix A. The Isat trace is the fluctuating component of the raw measured signal, Îsat. For the “early” times prior to t = 5.5 ms there is a coherent drift-Alfvén wave seen as the solid band in the 25 ≤ f ≤ 45 kHz range. During the time period of drift-Alfvén eigenmode activity the plasma transport is classical and agrees with the theoretical model. Figure 4.4: Time evolution of the power spectrum (color contour) with an overplot of the fluctuating component of an Isat signal (solid white) from the same spatial position ( r = 9 mm, z = 544 cm). Coherent fluctuations of the drift-Alfvén eigenmode are visible for t ≤ 5.5 ms. After 5.5 ms there is a sharp transition to broadband (exponential) spectra that correlates with the appearance of Lorentzian pulses. The Lorentzian pulses are visible as the large upward-going spikes in the overplotted Îsat white trace. Figure 4.5 plots two spectra that have been extracted from Fig. 4.4. The trace from the classical regime (solid black, t = 2.21 ms) features peaks due to the drift-Alfvén eigenmode at f ≈ 37 and 74 kHz. At a time after the transition to anomalous transport has occurred (dashed red at t = 10.73 ms) there are no coherent mode peaks. This does not conclusively demonstrate that the drift-Alfvén mode has decayed, rather, it means that the amplitude of the exponential spectrum is at least as large as that of the coherent mode. Figure 4.5: Extracted spectra from Fig. 4.4 demonstrating the character of the spectra before (solid black) and after (dotted red) the transition to anomalous transport. The amplitude of the exponential spectrum is well above the minimal levels observed for the early time trace. The discussion of the late-time turbulent environment of the temperature filament must include some features of the wave interactions and modulations preceding the transition to anomalous transport. It is clear that the large amplitude temperature oscillations associated with the thermal wave affect the radial temperature gradient, thereby modulating the amplitude of the drift-Alfvén mode. 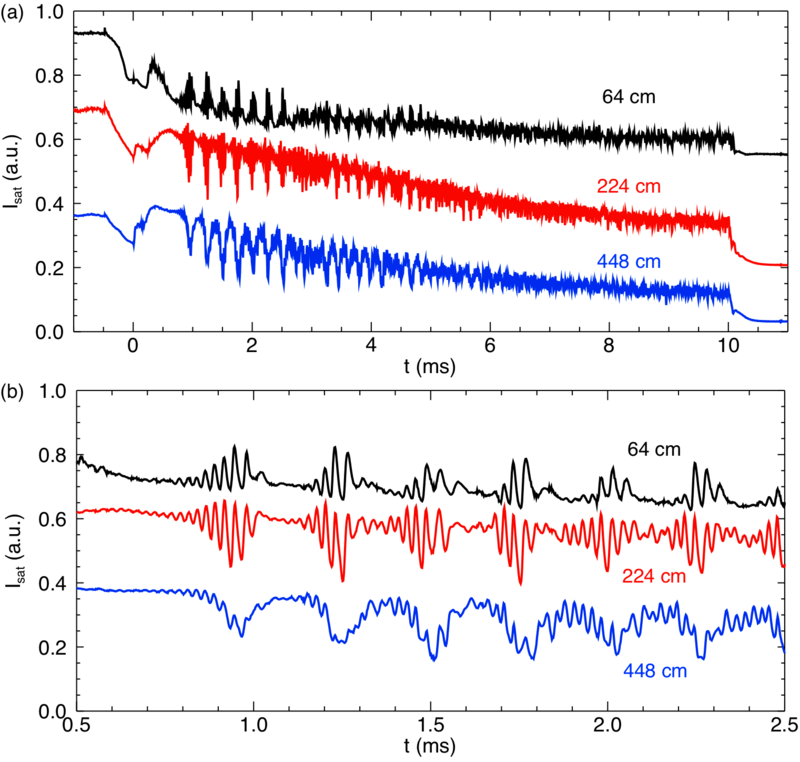 An example of drift-Alfvén modulation by thermal wave fluctuations is observed by performing a simultaneous measurement with three probes. Each probe measures Isat at a different axial and radial location for the same plasma discharge. Two of these probes are fixed in their respective radial positions while the third probe performs a two-dimensional position scan. The scanning probe is placed at z = 64 cm and the fixed probes are at (r, z) = (0.2, 224) cm and (r, z) = (0.15, 448) cm. Perturbations of the filament by the fixed probes are minimized by placing them in nearly up-down symmetric positions opposite each other. Figure 4.6 is a contour of the Isat signal measured by the scanning probe at t = 1 ms. The positions of the downstream probes are labeled with a dark blue “x” and text noting their axial position. Figure 4.6: Contour of Isat at z = 64 cm and t = 1 ms. Two downstream probes featuring a fixed radial position are indicated. Figure 4.7 presents measurements from all three probes during a single shot. The scanning probe signal (black, top) is acquired at r = 0.65 cm, in the outer region of the filament. Both panels feature offsets in the traces that have been added to clarify the presentation. The vertical orientation of the traces are the same in each panel. Panel (a) presents the full time series for this discharge. Panel (b) focuses on a narrow time region early in the filament evolution during which temporal correlation between the signals is apparent. Figure 4.7: Isat measurements at three different axial positions. The 64 cm measurement is acquired at a radial position of r = 0.65 cm, within the outer region of the filament. (a) Full time series (b) Narrow time series highlighting correlation between signals. The z = 448 cm trace (blue, bottom) of Fig. 4.7 shown in panel (b) exhibits low frequency oscillations due to the thermal wave. As expected, the trace at z = 224 cm (red, center), which is only an additional 0.05 cm radially outward, does not feature these oscillations. Instead, the z = 224 cm trace exhibits behavior similar to wave-packet phenomena in that brief sections of coherent and growing amplitude fluctuations are observed. The first of these is found at 0.8 ≤ t ≤ 1.0 ms. The trace at the z = 64 cm position (black, top) is also at the furthest radial position, r = 0.65 cm. The fluctuations in this signal appear rectified and are reminiscent of the pulses featured in Fig. 4.1. The Isat fluctuations in the 224 cm (r = 0.2 cm) trace of Fig. 4.7b begin to grow in amplitude as the low frequency component of the 448 cm (r = 0.15 cm) trace decreases. Activity is always observed on the 224 cm trace prior to observation on the 64 cm ( r = 0.65 cm). Due to the axial separation between these probes it is not possible to conclusively determine whether these delays pertain to a radial propagation velocity. However, it is clear that thermal wave oscillations near the center of the filament are correlated to changes in amplitude of the drift-Alfvén mode in the gradient and outer regions. The “threshold method” of pulse identification selectively identifies events of considerably large amplitude. Details are presented in Sec. B.3. Setting the threshold value to a larger value improves the accuracy of the detection. In this section the large amplitude pulses detected on a fixed probe are used to define a “pulse time” by which the measurements of another probe are averaged. The detection of a pulse sets the condition for generating this average from the other, downstream measurement. The data first shown in Fig. B.5 is used for this example. Using the signal from the reference probe as a temporal trigger, a portion of the signal acquired by the moving probes is extracted. Figure 4.8 shows that a smaller number of pulses are detected in the Isat signal (solid black) when the threshold level (horizontal dashed blue line) is set to 5 . The peaks of these pulses are used to define a new time axis, the “pulse time” axis in which tpulse = 0 μs represents the time of a given peak’s center. An array of such times are obtained. For each of these times, a portion of the signal from the other probe is considered. 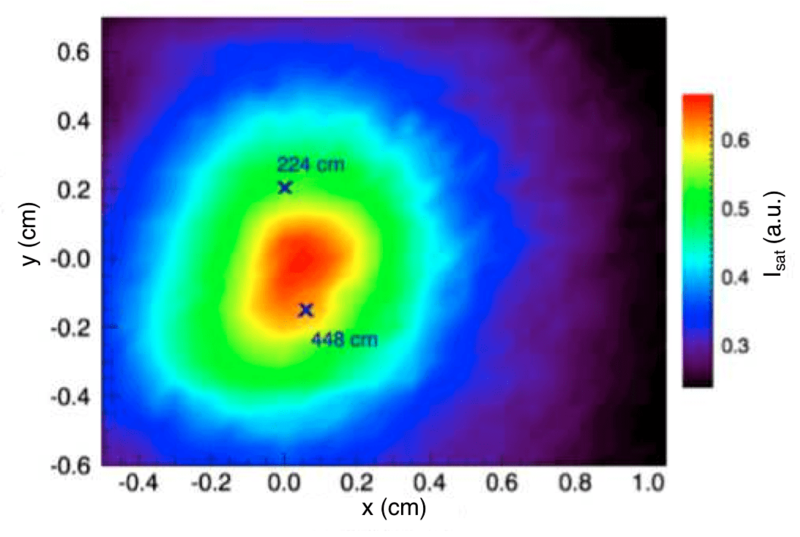 This segmented data represents the behavior of the plasma at this secondary position when a sufficiently large pulse is observed on the static probe. One such time window is shown by the partially transparent green area in Fig. 4.8. The pulse peak near t = 9.0 ms serves as the center of the pulse time axis. A width of 100 μs is taken on each side of the center. The data falling within this time window is then extracted from the Vf trace acquired using the moving probe. This process is repeated for each pulse detected above the threshold value. For example, a second 200 μs series is taken from the data shown in Fig. 4.8. This series is centered on t = 8.77 ms. If these were the only pulses detected, then the average of these two regions would be the ensemble result for the Vf signal. 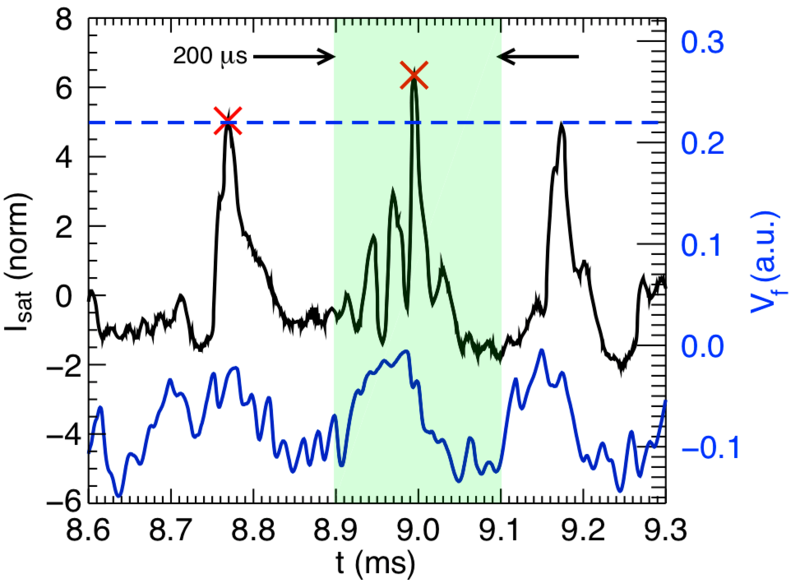 Figure 4.8: Amplitude threshold pulse detection from Isat fluctuations (solid black, top trace) defines a 200 μs region from which the signal on a fixed Vf measurement (solid blue, bottom trace) is extracted. The process of extracting data from the measurements of the moving probe results in a short time series for every position of the moving probe’s transit. The number of records that comprise this ensemble result varies depending on the number of large pulses sampled by the fixed trigger probe. Since this probe is purposely fixed in a region known to exhibit pulses, however, the variation in the number of detected pulses is generally minimal. Figure 4.9 illustrates the usefulness of this technique for studying profile modification. Panel (a) is a plot of radial Isat profiles according to three different pulse times. The trace representing tpulse = -100 μs (black) is the ensemble profile as it appears 100 μs before the center of a pulse detected on the fixed probe. This profile matches the typical temperature filament profile observed during the classical transport stage. It is also very similar to the trace that represents tpulse = 100 μs (blue), which is the ensemble profile that is observed 100 μs after the time center of the pulse. A major difference between these profiles and the one corresponding to tpulse = -10 μs (red) is observed. This profile represents the ensemble result observed only 10 μs prior to the center of the pulse. It is considerably wider and features a lower amplitude than the other profiles. This difference is highlighted by the normalized representation of panel (b). Figure 4.9: (a) Radial profiles of Isat relative to the time evolution of pulses detected in the outer region of the temperature filament. (b) Normalized versions of the data presented in (a). The profiles of Fig. 4.9 suggest that the observation of pulses in the outer region of the temperature filament is associated with considerable radial transport. Profile modification as treated in this Section, along with coherent mode modulation as treated in Sec. 4.2.3.1, provides context for reviewing the temporal shape of the pulse events identified in the temperature filament. As shown in the following Section, the pulses in this experiment feature Lorentzian shapes. Given the strong interaction between coherent modes, coupled with the sharp transition to an anomalous transport regime, the appearance of nonlinear structures is not surprising. The relationship between these structures and the observed exponential spectra is discussed throughout the rest of this Chapter.